I have just added a new student page.You may access this page by clicking on the tab that says Student Page 2 or by clicking here. These drawings and paintings were compiled from student work completed in the last twelve weeks of art classes. Thank-you to all my students for contributing and for all the hard work this last session! 🙂 You are all very talented! See you in the fall! 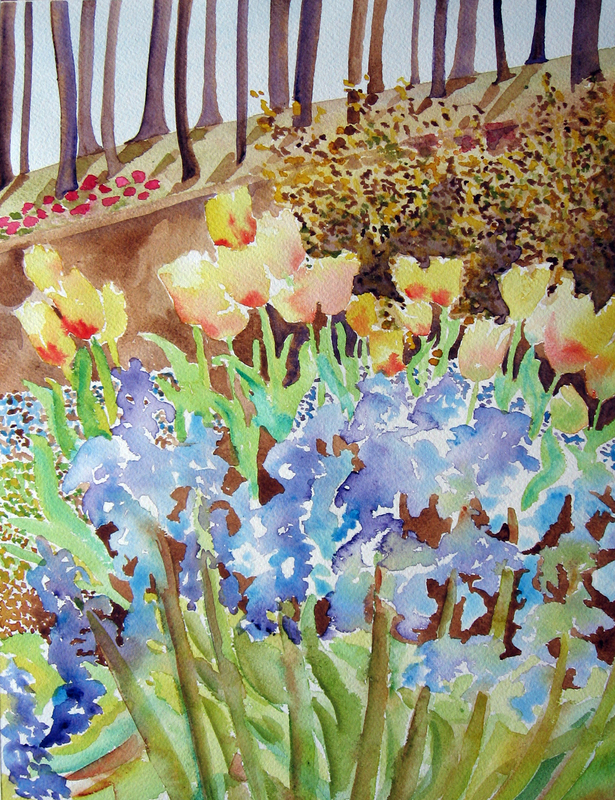 Splattering can enhance the look of a painting that appears a little flat or just too plain. For other examples see here and Beth Parker’s Coconuts. 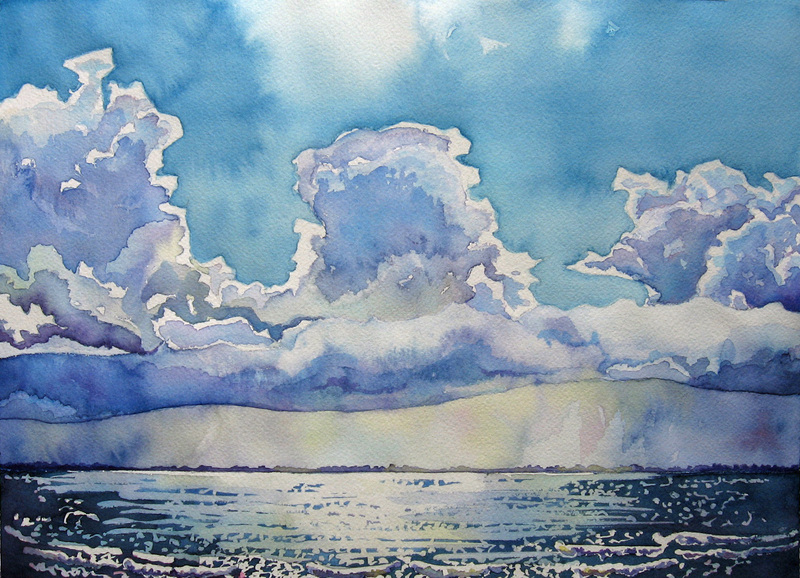 It can sometimes make it look like light, movement or added texture. 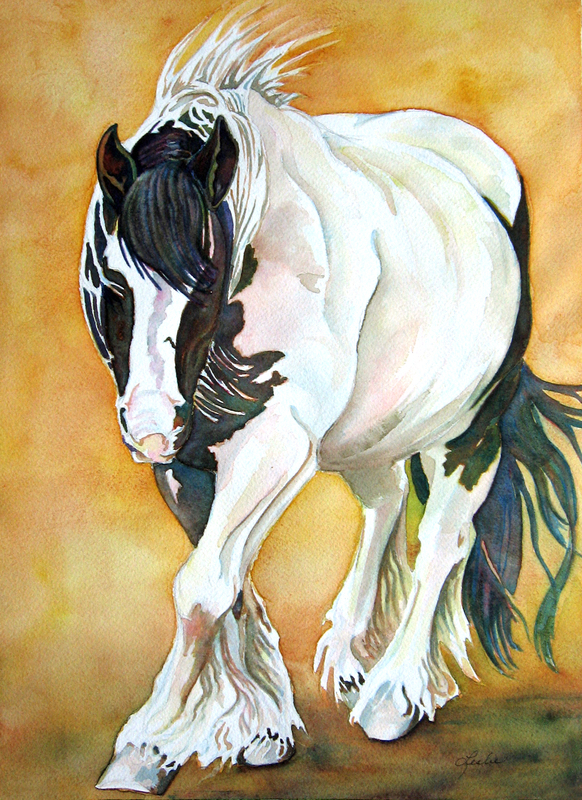 The above painting is of a Gypsy Cob or “Tinker Horse”. You can read more about this breed of horse here. I chose this painting to challenge myself, also. I wanted to work on capturing black by using the three primary colors. The other thing I found fascinating was the fact that the remainder of the horse was tones of white. I did not paint this piece fast. I carefully drew the horse as a line drawing. I modeled in the shapes in the the whites and the blacks by using varied saturations of red, yellow and blue. I mixed all my colors on the paper by scumbling them together with water. The background was painted after I wet it thoroughly and scumbled yellow and two reds together, softening and lifting with tissue as I worked. Stephen Kellogg has written a beautiful poem about this horse, here. I have followed Stephen Quirke’s blog here for about a year, now. I have been totally inspired to try to learn to watercolor, quickly. Most of the art I create quickly has been line drawings. Other than those, I usually spend several evenings in order to create something. I knew, in order to stay inspired and come at this slowly, I would have to set a time limit for myself so I chose two hours and the brush gets put down. I know, I know. That is longer than most of Stephen’s work, but it’s a start. I also decided that I would have to limit any drawing to a quick line here or there to divide my paper so I would not get carried away and run off the page. This is my first attempt. I finished in one hour and forty minutes and decided it was finished as anything else I might add would run over my time limit. I will continue to attempt to paint quickly and post them afterwards. I learned this can be as valuable to studying a subject as the continuous line drawings. Thank-you, Stephen, for the inspiration to paint fast! Jake was truly “one” man’s best friend. He is missed. I am not a pastelist but took a couple classes in pastels a few years back. 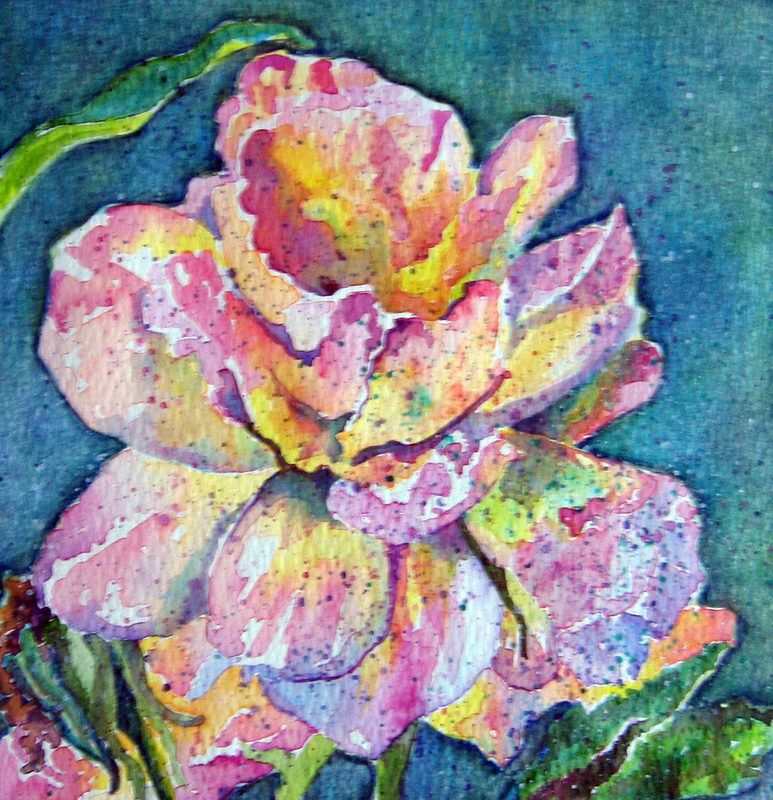 I manage to use them more as a drawing medium than these beautiful layered paintings I see accomplished artists create. For class, we were instructed to watercolor a background on coldpress illustration board and create our pastel on that. This was mine. The reference for this scene was actually a winter one with snow covering the fields and path. As a challenge I attempted to imagine how the same scene would look if spring pushed itself into this particular landscape. For a few days before painting this, I payed particular attention to fields and tree lines in the country around my area to come up with the colors I used in this. I noticed how bright and sunny everything looked. 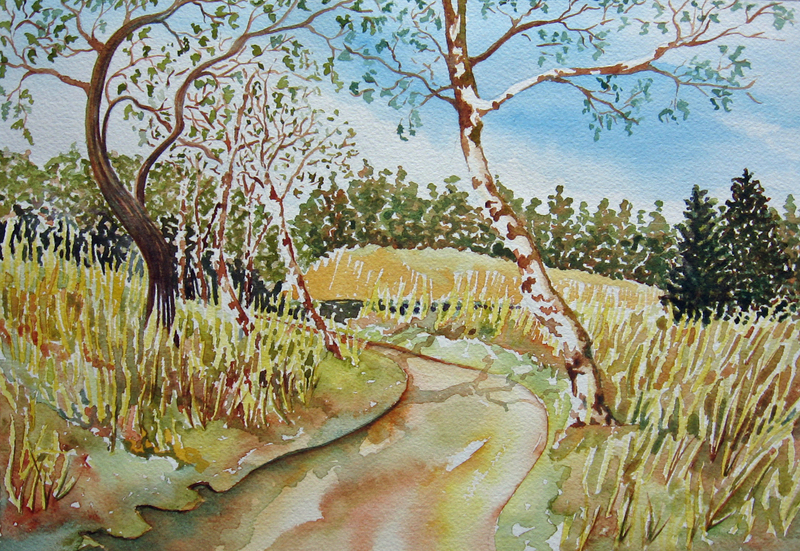 Stephen Kellog has honoredthis painting by writing a poem about it here. Thank-you, Stephen! 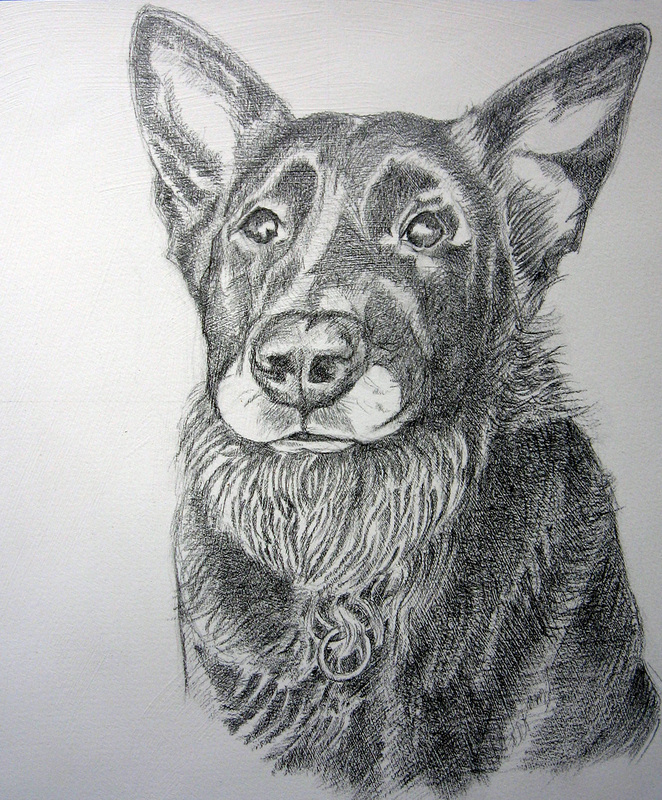 Reno is a black shepherd of a friend of my daughter. I was asked to see what I could do with graphite and Reno’s image. I have to say that the photos I received drew me right in to wanting to try this project. The above image was my first attempt. I used Stonehenge 250 GSM vellum finish paper and 2B thru 6B graphite pencils. I began the drawing with contour line and some light cross contours trying to build up his form. For the intial line I used the 2B pencil pressing down a little on those lines I wanted to be evident in the final drawing. Next I built up his coat with textured strokes trying to mimic his coat. I built the darker areas up with cross hatching and some cross contours across the bridge of his nose. I used 3,4 and 6 B pencils to do this. 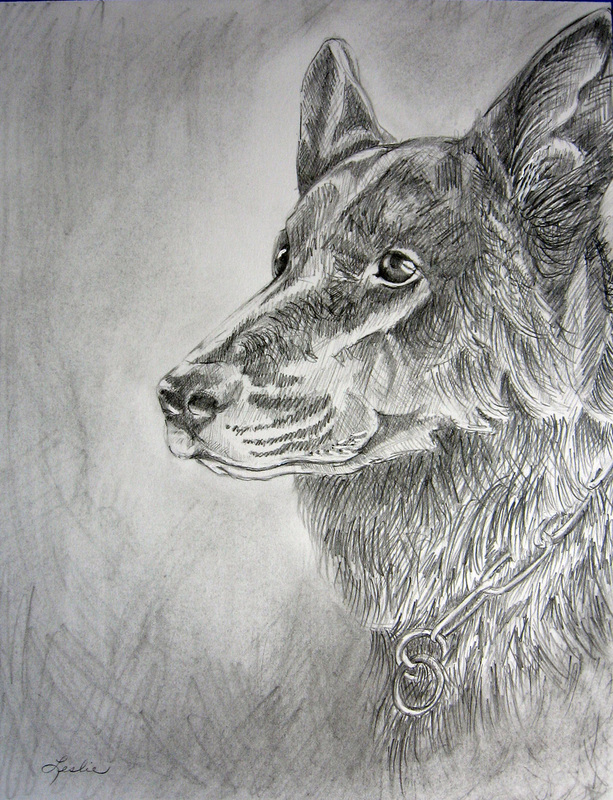 I next used a kneaded eraser to smudge out some of the detail in his coat in the bottom right hand corner. I built the background by scratching in loose abstract marks with the side of a dull 3B pencil. I then took my 4B pencil and scraped over a piece of rough sandpaper allowing the pwdered graphite to collect on a sheet of note paper. I took a non-lotioned kleenex and picked up the graphite powder I made and began to rub it into the background. I left the background light around his nose and head and darkened the remainder with several layers of the 3B powder. This process also took the edge off the random marks I’d made earlier but still allowed them to show through.I did not smudge the portrait and had to be careful to not rest my hand on his head throughout laying in the background. I had always admired drawings I had seen on gessoed paper, so I decided to try one with Reno, above. I used a bristle brush to apply acrylic white gesso to a piece of Aquarius II watercolor paper, making sure I applied the gesso in abstract strokes running different directions. This leaves the artist with a textured surface to work on. I then drew Reno again using contour and cross contour line. The graphite looked darker on this surface right away so I began with a 2H. I then began crosshatching the forms of the darks in gradually working up to a B pencil and finishing with a 3B. The texture of the gesso supplied the textural qualities you see in this drawing. I had to be careful to not rest any portion of my drawing hand on the work as it immediately smudged. I did no rubbing to produce this image. I thoroughly enjoyed working on a gessoed surface and will use this as a support for drawing again in the future. I sprayed both drawings with Matte Fixative to prevent smudging with handling. Thank-you, Chrissie, for introducing me to Reno!